The 2017-2018 season will be our 16th summer competing against the best competition. Every year we are looking for the BEST lacrosse players for each team. We only have one team at each level. The competition for spots on each team is intense, as over 600 lacrosse players tryout for spots on our teams. That means a lot of very good lacrosse players do not make Leading Edge teams. This also means each team is picked independant of the others. As much as we would like to always be able to accommodate multiple boys from one family, it is not always possible. 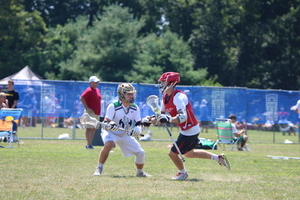 Each team selects the best players available to Leading Edge Elite. Players that make it to the Leading Edge are rewarded by knowing they are playing with outstanding players, being coached by outstanding coaches and being challenged by playing against the other TOP club programs in the country. Leading Edge is uniquely positioned in NJ by being the only program selected to be part of the National Lacrosse Federation (http://www.nationallacrossefederation.com). The NLF members are the strongest club lacrosse programs in the country. Membership gains Leading Edge Elite team players the opportunity to play in the most competitive and exlcusive tournaments and showcases available! As we prepare for the upcoming Leading Edge Elite tryouts, we would like to take this opportunity to make sure we are all properly oriented and to pass on some important information. The Leading Edge Elite mission is to (a) identify the most skilled lacrosse players with a potential, capacity and dedication to improve those skills and play at the highest competitive levels; (b) provide an environment in which young men can maximize their development as players and as men; and (c) facilitate the ability of our players to leverage their skills into the best possible opportunities for a college experience. Although it is hard to measure everything we do, one metric that we are particularly proud of is 80% of the players on our high school elite teams have received an offer to play Division 1 lacrosse, and 100% of our players have played intercollegiate lacrosse in college. Provide a staff of the most accomplished coaching talent available, with a passion for the Leading Edge Elite mission. Enter our teams in the most competitive tournaments that are reasonably available to us. Create a practice schedule that is dominated by a work ethic designed to maximize skill levels and the competitiveness of our team. Maintain highly credible relationships with college lacrosse coaches and facilitate the recruiting process. Continued dedication of our players to their lacrosse and personal development. These are not just words. This is the cornerstone of our operation. If our players do not have this, Leading Edge Elite participation is a waste of all of our time, effort and money. Perfect attendance at all Leading Edge Elite practices and games. Active communication with your Leading Edge Elite coach, including immediate notification of health issues, personal emergencies, college choices, academic performance and standardized tests results. Timely payment of all Leading Edge Elite fees and related tournament expenses. We do not have the resources to pursue collection efforts. We are excited to begin the tryout process over the coming weeks and look forward to seeing you on the field. There are no refunds for and Elite Team Program. We offer an insurance program for your fees each season. We strongly encourage you to take advantage of this program.